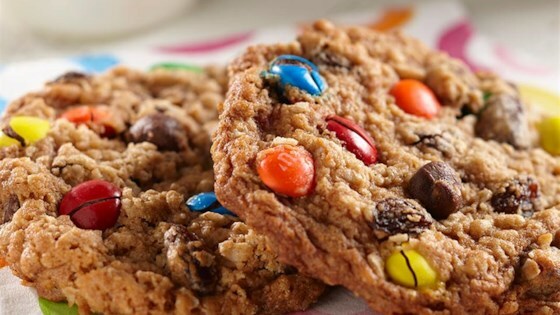 "Soft and chewy...you'll get monstrous compliments on these cookies." Combine quick oats, flour and baking soda in a medium bowl; set aside. Cream butter and sugars in a large mixing bowl. Add peanut butter and mix well. Mix in eggs, corn syrup and vanilla until well blended. Stir in oat mixture. Fold in chocolate chips, candies and raisins. Drop 1-1/2 inch mounds onto ungreased cookie sheet and bake for 12 to 15 minutes until cookies are just set. Cool on wire rack for 5 minutes and then remove from pans. The cookies turned out wondeful. A tip though to anyone making these grease your pan especially if its a dark one.